Lately, if you have been following me on Instagram, you have been probably hearing about how I’ve been really stressed out. Partly the reason why I hadn’t been posting as much in the recent months, because life got really out of hand. I got really stressed out, anxious, my project completely changed direction and I thought I would be ready to defend my thesis by the end of the summer, walked at graduation, and now my plans are completely different (or at least delayed). I guess everything happens for a reason. I didn’t get the job I interviewed for (the one that I thought was my perfect match, guess it wasn’t so perfect after all), I started getting contradicting (but good I guess) results, I got a dissertation year fellowship, so the fact that all of my Plan A’s didn’t work out, my Plan B is coming in handy now, even though I didn’t appreciate it at first; so now I don’t have to worry about TAing while trying to figure out the jumble of confusion that is my life right now. And while things haven’t been working the way I planned (Oh science, that’s how you must be, right? ), the one thing I HAVE been able to control is my exercise and health routine. I gained some weight from losing my work out momentum, stress, eating whatever I wanted, and I fell back into the stress and anxiety routine I worked so hard to get over. I referred back to my health and fitness community over on facebook and I refound my inspiration. I started a workout program that’s available for free on the Beachbody On Demand that I subscribe to, and with the help of 2 other amazing ladies, we are keeping ourselves accountable for getting the workouts done – as in, we have a group chat going and we each message the others when we are pressing play on our workouts and get it done! It has really helped me manage my stress and anxiety and really helped me make time for myself. I have started regarding working out as “Me” time, and a meeting I make with myself, and I’m not allowed to skip it, just as I wouldn’t skip a work meeting, etc. While I have been struggling a little still, I am doing a lot better with managing my stress. I am obsessed with my new life style, when I have a rest day, I am just itching to get back to working out! Along with working out, I have been getting back into blogging on a regular schedule, and it doesn’t feel like work when I get home from a long day and sit in front of my computer to write up a post. That’s how you know it is something you enjoy, when even tho it takes some time and creativity to put together a post, you don’t mind it, even if you are tired. I have been working out “so much” because with everything else being out of my control, whether I’m not getting the job, the experiment not working, my fitness is one thing I CAN control. I’m going to get out what I put in. I’m excited to be STRONG and work on my strength. I’m currently doing a lifting program along with adding in some dance cardio every day as well. I’m already 3 weeks into the program and I can FEEL the changes! Anyway, here is the cute workout outfit along with some stretches and workout moves to try! 1. Wall Sit – work that lower body by holding a wall sit for 30 seconds for 3 times, and increasing the time until you can hold the wall sit for 5 minutes! For an extra challenge, lift one of your legs parallel to the floor and see how long you can hold it, and alternate your other leg. Feel the burn in your quads and your glutes! 2. 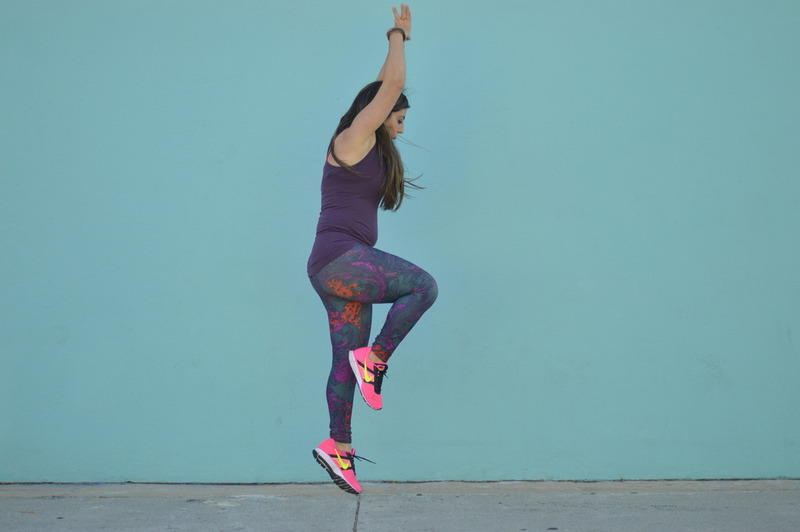 Loaded Jump – This one will work your legs, lower abs, and raise your heart rate, from a lunge position, push your self up into a jump, and bring your leg up, crunching your lower abs in. Do 10 reps for 3 sets, and feel your heart rate jump! 3. 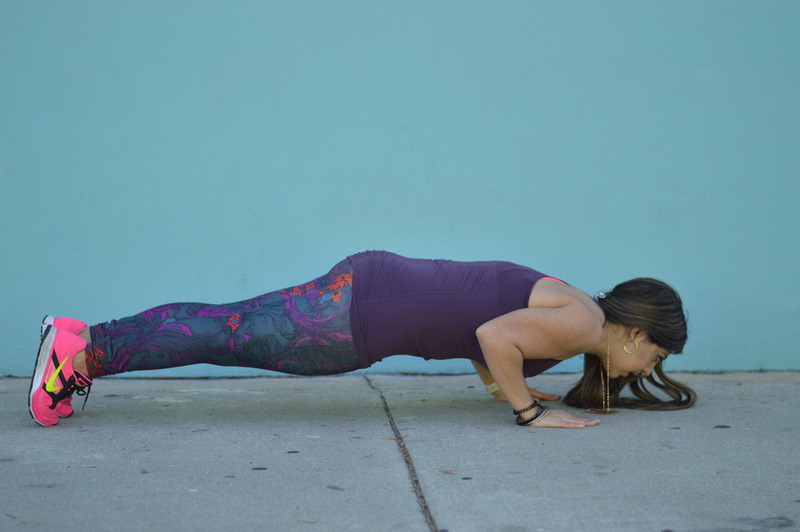 Plank – and variations – Get into a plank position and hold for 30 seconds to 1 minute, working up to when you can hold a plank for 5 minutes! Once you get a hold of a plank, try some tricep pushups, where you are going into a push up but your elbows are held close to your body! Make sure you can feel it in your triceps! And lastly, mountain climber, while in plank, bring your knees in one at a time and speed it up, this will work your abs and raise your heart rate! These are all really tough moves! 4. Downward facing dog – this stretches your entire body, stretches your arms, shoulders, your legs, just an all around great move to do. 5. Lunges – This is a great move to work your lower body, and there are so many variations, you can do static lunges, where you repeat this move on both sides (3 sets of 10), walking lunges, jump lunges, and more! Look them up and try them! If you’d like to sign up for Fabletics, you can get your first outfit for $25 by clicking HERE! And if you are interested in what I’m doing to stay sane for my workout programs, send me an email at my contact email here, you can email me at labcoatsandlegday (at) gmail (dot) com, or fill out an easy survey to get involved HERE. You can also follow my fitness journey on my fitness instagram @labcoatsandlegday (made a fitness account separate from my @phd_fashionista IG account!). These structured workout programs have been a lifesaver. and while I am still working on dealing with my anxiety, it really is helping. Listen to your body, take care of your body, you only have one. Previous Post Beach Chic Essentials – Don’t want summer to end! I am about to start my yoga practise again after being out for almost 5 weeks due to injury and this was such an inspiring read. Sometimes we fall back due to unavoidable reasons but what's important is we pick ourself up and start all over again. You look beautiful in this outfit – go you!! And trust me I know the feeling when things dont go according to your plan – here is science for you. Keep strong , keep sweating and lifting weights but most important keep smiling!!! I love this workout gear. 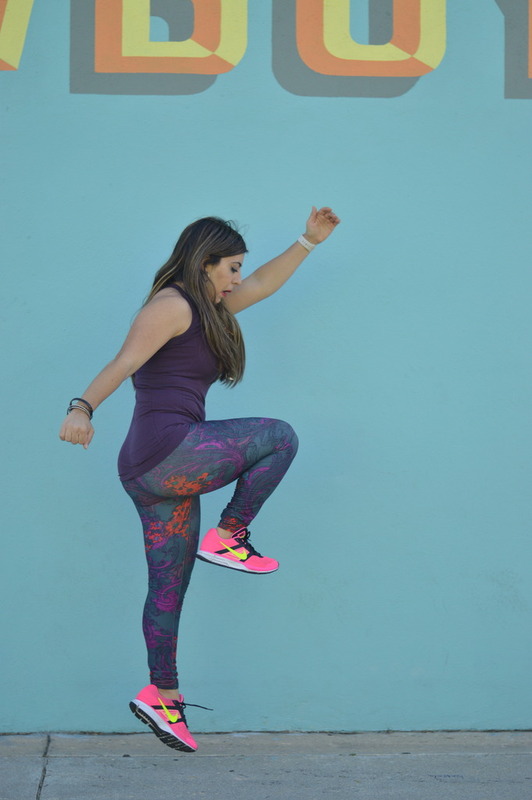 Girl, you look AH-MAZING in your super cute and colorful workout gear! 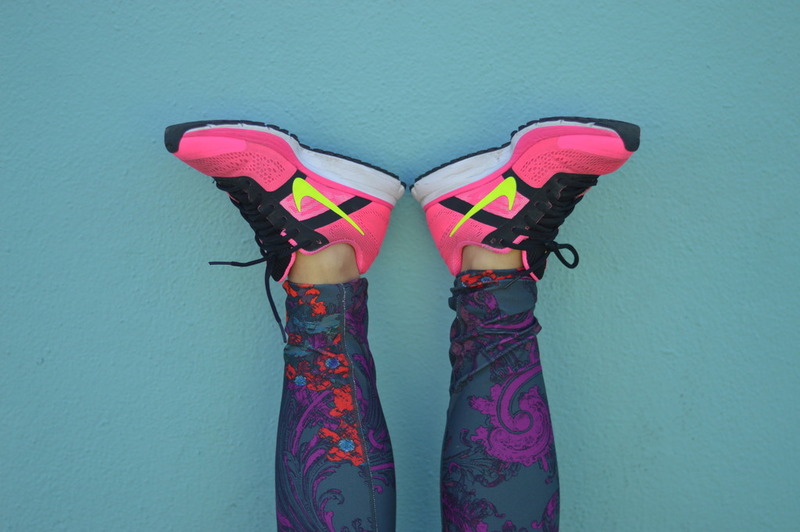 I'm a sucker for printed workout pants, so my eyes opened real wide when I saw these, haha! Plus, purple is your color, girl! Thanks for sharing these workouts with us and I hope you have a great week ahead, beauty! I am so amazed, dear Andrea, so so so amazed! The wall sit really impressed me, I didn't know about that, and I wish I could do that! I think I have to practice! It's so good that you felt the change already and that you never miss it, and you have the support of the ladies! 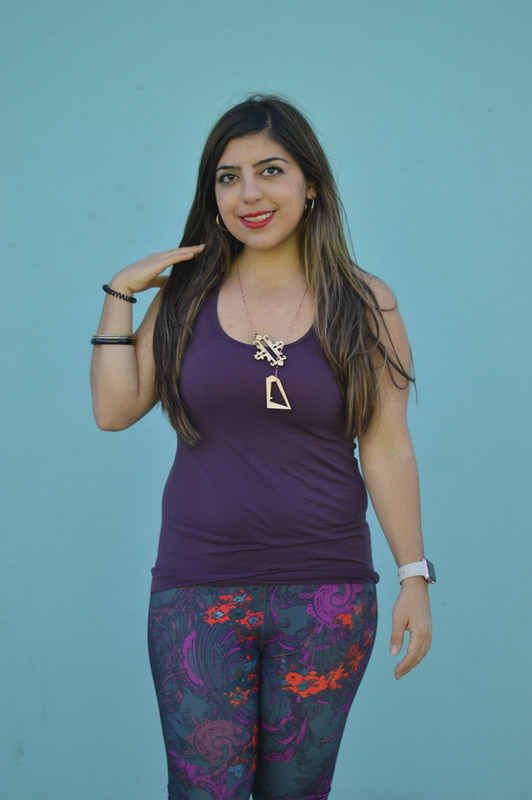 You look fabulous, the name Fabletics suits very well, I loved the workout pants! I am sorry for the delay of the thesis, the job interview, but I know that sometimes all happen for a reason. You will just discover it in the future, maybe something much better comes, I am sure! I hope you keep us posted and wish you a great week! Hugs! hey andrea! life can get really hectic. just as you think everything is together, something happens. i've been there so many times. sometimes we have no choice but to go to plan b, c or d! LOL i think you've handled things well. good for you in jumpstarting your fitness routine. it's a great way to decrease stress and it just makes you feel good. pretty work out clothes also help 😀 take one day at a time and control what you can control. you look great. I love these workout pants. The material of workout gear feels awesome, mostly cotton with just enough stretch which is what I love. I got the medium and they fit perfect. I definitely wanted more of these and got another with different style. Hi Andrea, I am sorry to hear that you had a stressful week and that you didn't get the job that seemed like a perfect match. But let me tell you: There's most definitely something better waiting for you out there! And I am so glad that you are back to blogging! I've missed you and I love this post! 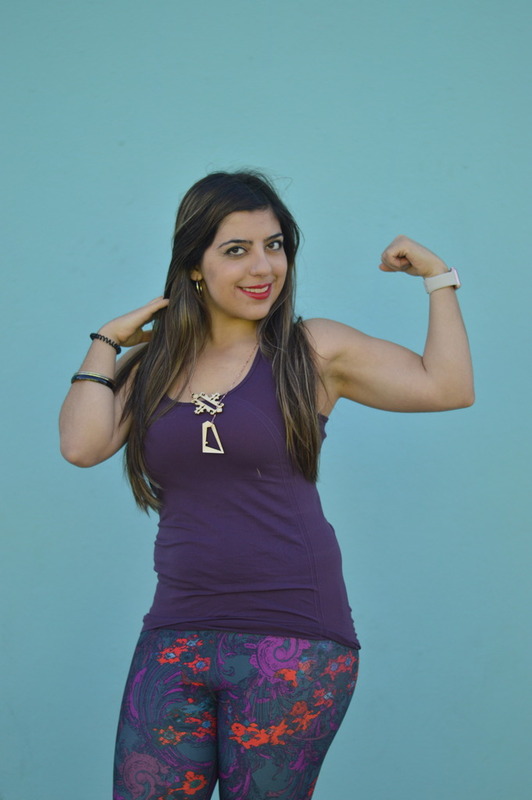 Your work out routine is amazing and you totally inspire me to do more myself! I've been way too lazy! I love these workout leggings. The material feels awesome, mostly cotton with just enough stretch which is what I love. I got the medium and they fit perfect. I definitely wanted more of these and got another with different style. It's so great to found valuable article.Fitness can be measured in a variety of ways but your ways is really impressed me.Hope my wife be happy to see your article.